A unique protocol of near-field excitation for generating photocurrent with strong impact in solar cell applications is demonstrated here. 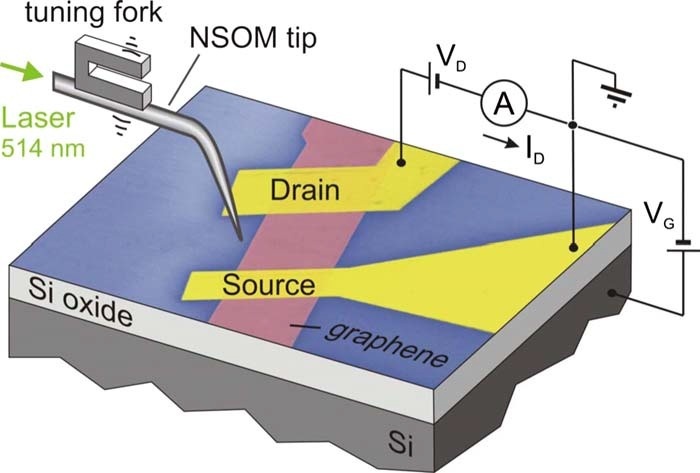 A near-field scanning optical microscope has been used to locally induce photocurrent in a graphene transistor with high spatial resolution. By analyzing the spatially resolved photoresponse, it is shown that in the n-type conduction regime a p-n-p structure forms along the graphene device due to the doping of the graphene by the metal contacts. The left picture shows the SEM image of a graphene transistor and the electrical setup for PC measurements. On the right seven PC images taken at gate biases between -60 and +100 V are shown. The dashed lines indicate the edges of the source and drain electrodes. The two scale bars on the bottom of the very right image are both 1 nm long. Schematic illustration of the experimental setup and sample structure.